Description: Our sticker printing service gives you stickers printed in full colour on one side on self adhesive paper. Easily applied to a variety of surfaces. Our stickers are printed in full colour on one side on eco-friendly paper from sustainable sources. Our prices include FREE delivery within 6 working days to one UK address excluding Highland and Islands and there is no charge for debit or credit cards. For deliveries to Highland and Islands please call for a price that includes delivery to these locations. 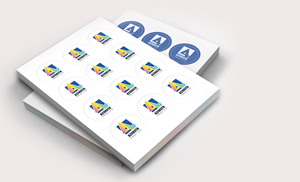 If you need your sticker printing sooner, contact us to discuss a quicker delivery time. What can printed stickers do for me? Most businesses will have a requirement to use printed personalised stickers and labels sometime during the company or organisations lifetime. Stickers are great way to make an instant impact and quickly spread your message to a wide audience. They have an almost infinite number of uses, including mail outs, record labels and they can decorate anything you want. 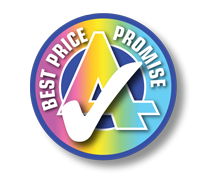 Azimuth Print, the UK's premier sticker printer offers a quality, cheap sticker printing service. We Print can print stickers in A7 (74mm x 105mm), A6 (148mm x 105mm), 85mm x 55mm, square (74mm x74mm ), small circle (35mm dia), medium circle (50mm dia) and large circle (60mm dia) sizes. They are printed in full colour with self-adhesive reverse. You can either send us your own artwork or commission our designers to come up with a great look for your printed stickers for an extra charge. If you need to make small changes to your copy and design, we can take care of these at no extra cost, while larger amendments to your sticker can also be made for a fee. To find out more about the UK's premier sticker printer, just get in touch for a quote or for answers to any questions you might have about our sticker printing services. What are stickers used for? If you take time to notice throughout your day you will find that stickers are used for a tremendous number of reasons. Almost everywhere you look you’ll see stickers employed to decorate, advertise or communicate important information.